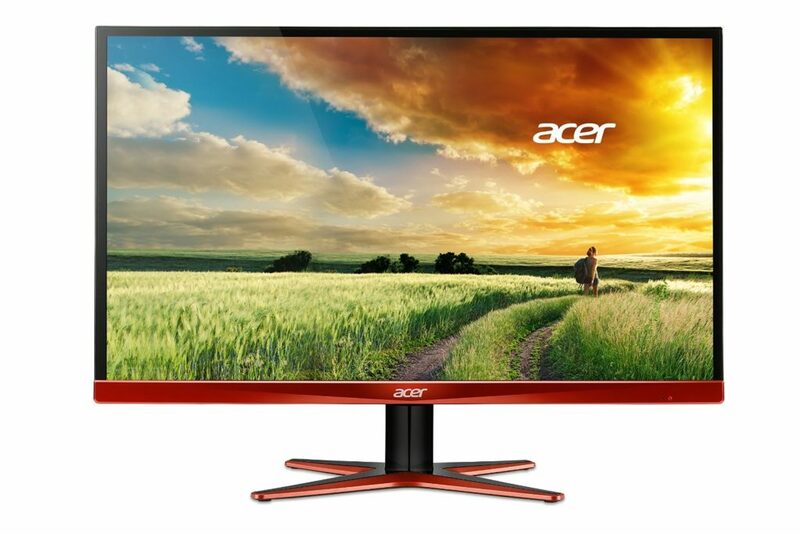 Acer gives you a gaming monitor that is incomparable to other monitors within its price range when it comes to gaming specs. A 27” inch 1440p QHD screen delivers great sharpness and when combined with the 144 Hz refresh rate you get a gaming experience smoother than most monitors can deliver (again referring to the relativeness of the price). Motion blur and ghosting becomes quite frankly, an extremely rare thing, when combined with an AMD R9 series GPU because of the response time and the refresh rate. The fast input lag time also helps the competitive gamer for more precision during games and basically relies on all errors that potentially could occur to external factors such as internet connection, RAM or CPU performance. The AMD GPU will also work excellent with the Free-Sync technology as we didn’t experience a significant drop in fps during gameplay as you might expect when using G-Sync. Since we started with a reference, we will end by another one: You can’t have your cake and eat it too. The stand seems a bit unstable for the already quite thin but large screen. When calibrating your preferences the OSD buttons seem stiff and when pressing them you get a feeling that you should be prepared to hold the monitor because of the wobbling. The I/O ports are located out the back, which seems kind of odd and unreliable and since there are no cable management, you should use cable ties if you wish to hide the cables. The TN panels show its usual weakness in image quality and viewing angles and since the stand can only tilt you are required to be creative when placing the monitor. All in all a great monitor for the competitive gamer, which outperformed the other gaming monitor on this category when playing graphical online fps games. Considering the specs, price and performance we have declared this our editor’s choice for the competitive gamer category. 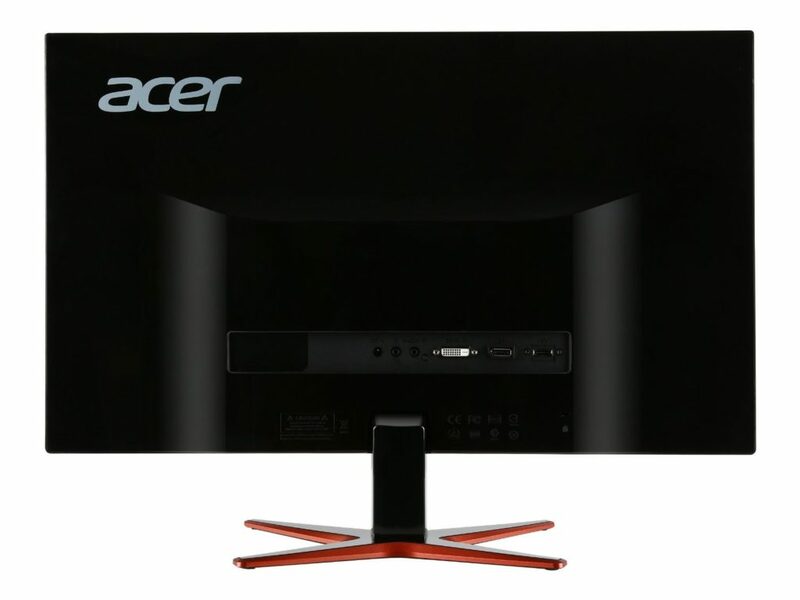 Acer’s contribution to the gaming monitor market is mainly dominated by their Predator series, the Predator XG270HU being one of them released earlier this year (2015). 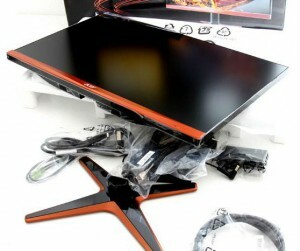 At first glance, the monitor, which resembles how a stylish gaming monitor should look with a good choice of colors, seemed a bit ‘cheap’ or ‘plasticy’. The stand also doesn’t come with a lot of ergonomic possibilities since you can only tilt and besides seems quite unstable for the large screen it is supposed to handle. As a standard, the brightness is on 100%, and calibrating the settings makes you aware of the instability of the stand. The buttons can seem stiff and when pressing you get a worrying feeling. Connecting the cables cause the same awareness. Exciting to see how the specs worked in real life, we immediately started testing its performance during various games. Because of the specs, we expected it to perform well during fps games. A refresh rate of 144 Hz, a response time of 1ms and an input lag time of 5ms just increased our expectations, which isn’t always a good thing. The 27” screen comes with a resolution of 2560×1440 (QHD), which isn’t that common for monitors in that price range. At the time of this review, the Acer Predator XG270HU is the third gaming monitor that comes with a WQHD resolution on a 27” screen along with the popular Asus ROG Swift PG278Q, in 2014 and the BenQ XL2730Z. That alone means an increased visibility of 77% of the desktop display compared to 27” Full HD monitors. As with other TN panels, this one also produce the standard 72% color gamut spectrum and the viewing angles are, as you would expect with a TN panel – not great. However, unless you are planning to have an audience behind you to watch you play, being placed at the center of the screen should neglect this issue as a real problem. If you are looking for a much wider color display, the IPS version of the Predator XG270HU is available (XB270HU), which has the same specs but with an IPS panel and G-Sync instead of Free-Sync as the adaptive sync technology. It usually gets easier to lower the input lag time the higher refresh rates, the monitor (and GPU) is capable of displaying, which is why the input lag time can be kept at a fast 5ms. Enabling the Free-Sync will help to maintain the input lag since the refresh rates of the monitor and GPU is synchronized. The 144 Hz and 1ms response time also prove quite well during gaming. Playing online battlefield 3 really gives you an advantage with the smoothness this monitor is capable of displaying. You should notice that the OverDrive function should be kept at ‘normal’ if you wish to reduce the ghosting and motion blur at an absolute minimum. Taking the Over Driver to extreme will increase the response time to 7.7ms, which is noticeable when you are used to 1ms. Enabling the Free-Sync further increases the gaming experience and is quite noticeable during gameplay. You will sense more smoothness and have a feeling that your computer is capable of running the game at highest details with ease (a sense of excess power). However, an AMD GPU that supports adaptive sync is required. For gamers where performance exceeds longevity and who plays online fps games on a competitive level, the Acer Predator XG270HU is the best you can get for $445 (amazon). We’ve done the research and explored the market for you and it is therefore not a coincidence it won the editor’s choice. Tradeoff on stand ergonomics and lack of motion blur reduction feature (which usually comes with NVidia’s G-Sync feature and BenQ gaming monitors), is a balance of fast response time, high refresh rate and evidently input lag time. Longevity is a concern as well. We have a gut feeling that the monitor easily breaks but if you take care of it, you should be fine. If you play single player games like Skyrim or other games where you might value color and image quality above refresh rates and response time (strategy games in general), you should go for a monitor with a larger color spectrum, mainly an IPS panel. For competitive gaming, this monitor fulfills all your needs. Read our buyer’s guide for gaming monitor here. Check this monitor in Amazon.